MAG Ireland’s European liaison Peter Bartlett today joined dozens of other rider representatives from across Europe who together with a number of MEP’s took part in the MEP ride out organised by FEMA. First run in 1996, the MEP Ride is an opportunity to bring together ordinary riders, the motorcycle industry, riders representatives like MAG Ireland, and some of the EU’s key policy makers in a relaxed and informal setting. It is one of the main FEMA events. A MAG Ireland representative regularly attends the MEP ride as it’s a unique opportunity to talk to MEP’s about motorcycles and demonstrate the positive aspects of motorcycling. “The motorcycle ride in the capital of Europe, aims at raising awareness among European decision-makers on the contribution of motorized two-wheels to sustainable mobility. More than one hundred motorcycles will joyfully cruise through Brussels’ streets escorting MEPs, officials of the European institutions and stakeholders. 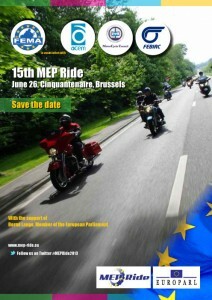 The MEP-Ride is a unique forum for the motorcycling community to meet and exchange with representatives of the European institutions. Users, represented by FEMA, the Federation of European Motorcyclists Association, are calling for recognition of their rights as road users, as well as for a proper integration of powered two-wheelers (PTW) in transport policies. Using a PTW in Europe is becoming a complex and expensive endeavour, with harder to get licences, growing insurance costs and inadequate infrastructure. Unemployment makes it very hard for young Europeans to even come near to this traditionally affordable transport mode. “Together we are promoting the benefits of motorcycling in terms of energy efficiency and quality of life,” said Frédéric Jeorge, FEMA President. “Motorcycling is a great way to enjoy tourism and sports, but it is also a smart way to beat congestion. If policy makers are serious about reducing traffic, costs of transport and pollution, they must include the use of PTWs as one of the sustainable mobility alternatives. Motorcycles provide mobility and as such deserve a full recognition in transport policies. 37 million Powered Two-Wheelers circulate in Europe. A growing number of European citizens use PTWs on a daily basis to beat the traffic and find a parking place in city centres, both for private and professional use. Today, more that 60% of new PTWs sold in Europe are intended to for urban use. “Riders, continued Jeorge, today stand for sensible and sustainable mobility. Effectively solving traffic problems while improving the quality of life in European cities requires innovative solutions. This is why we decided to include electric vehicles in our ride”. Motorcycle manufacturers, represented by ACEM, support the event and will provide the vehicles that will be used by MEPs, officials from the EU Institutions and the other participants. Electric scooters will also be a highlight of the event. Before leaving for the ride their motorcycles, MEPs will have the opportunity to try different models of vehicles with electric propulsion on an enclosed track. Motorcycling is a passion shared by many Members of the European Parliament. Riders will be joined by Bendt Bendtsen DK-EPP, Fabrizio Bertot IT-EPP, Christian Ehler DE-EPP, Matthias Groote DE-S&D, Bill Newton Dunn UK-ALDE, Antonyia Parvanova BG-ALDE and Wim Van de Camp NL-EPP, who was rapporteur of the EU Regulation on the type approval of motorcycles that will improve the safety of PTWs while reducing their emissions. Brussels, in the heart of Europe, is one the most congested cities in the world. Yet Belgian authorities are denying motorcycles and scooters full recognition as a sustainable mode of transport, despite a 26,3% drop in fatal accidents (2011-2012) and studies (Commuting by motorcycle, an impact analysis, Transport & Mobility Leuven, 2011) demonstrating that the total external emission cost of motorcycles (all pollutants combined) is 21% lower than that of an average car. The Federation of European Motorcyclists’ Associations (FEMA) is the European federation of national road rider organisations. FEMA represents, defends and promotes motorcycling and the interests of million powered two-wheeler users across Europe. Through its 25 national organisations from 20 countries, FEMA reaches over 300,000 dedicated motorcyclists representing all social groups. FEMA’s primary objective is to represent European motorcyclists both within the European Union and agencies of the United Nations. Press contact: Frédéric Jeorge, FEMA President, +32 (0)495501555 or president@fema-online.eu. ACEM, the Motorcycle Industry in Europe, is the professional body representing the interests and combined skills of 14 powered two wheelers (PTWs) manufacturers producing more than 30 brands, and 15 national associations out of 13 European countries, employing over 127.000 people. The aggregated turnover of the PTW sector (manufacturing, plus upstream and downstream activities) amounted to Euro 26 billion in 2010. Manufacturers alone account for Euro 7 billion. The members of ACEM account for 90% of the production and up to 80% of the European powered two-wheeler market. ACEM also represents main manufacturers of tricycles and quadricycles. Press contact: Filippo Segato, ACEM Communication Officer, +32 (0)2 2309732 orf.segato@acem.eu. FEBIAC is the Belgian Federation for automobiles and motorcycles with 140 member companies passionate about the world of vehicles. Its mission is to promote, analyse, objectify and communicate about the sector to politicians, journalists and the general public, concerning mobility, environment, road safety and taxation. FEBIAC plays also a vital role in the training of actors in the automobile sector. FEBIAC is a major partner of organizations combatting mileage fraud such as Car Pass and or guarantying the control of recycled materials such as Febelauto. FEBIAC and its members represent 650.000 new vehicles every year, a turnover of 80 billion euros, 2,4% of the PIB, 100.000 employees and a fleet of 6,9 million vehicles. FEBIAC supports the MotorCycle Council, regrouping all Belgian associations dealing with riders and motorcycles.